Pacific Gas and Electric Company. Very Good- with no dust jacket. 1970. Paperback. Stapled wrap edge worn and slghtly stained. ; 10.25" tall; 40 pages . San Francisco: Pacific Gas and Electric Company, 1970. 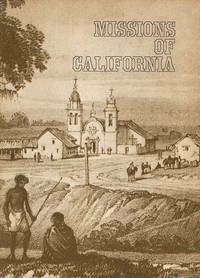 40p., 7.5x10.25 inches, illustrated with photos and figures and a map of the Missions of California, very good booklet in stapled tan pictorial wraps. San Francisco: Pacific Gas and Electric Company, 1970. Paperback (Saddle Stitched). Very Good. Unmarked. Embossed on title page by previous owner. Previous owner's sticker inside back cover. Illustrated. Maps. 40p. Missions include San Deigo de Alcala, San Carlos Borromeo, San Gabriel Arcangel, San Francisco de Asis, Santa Clara de Asis, Santa Cruz, Santa Ines, and others. San Francisco: Pacific Gas & Electric Co, 1970. presumed 1st. Paperback in pictorial wraps, saddle-stapled.. VG+ unmarked.. Compiled from articles in the PG&E Progress magazine. 7-1/2 x 10-1/4, 40 pp, sepia photos & illus, map. San Francisco, CA: Pacific Gas & Electric Co. 1970, 1970. Quarto, softcover, VG in pictorial brown wraps. 40 pp. The story of the founding of California through the chain of missions built by the Spanish. Contains photography of missions, maps, and two-color illustrations.. Paperback. Very Good/No DJ. Pacific Gas and Electric Company. Used - Good. Ships from Reno, NV. Former Library book. Shows some signs of wear, and may have some markings on the inside. 100% Money Back Guarantee. Shipped to over one million happy customers. Your purchase benefits world literacy! Pacific Gas and Electric Company, January 1970. Paper Back. Acceptable. SAN FRANCISCO: PACIFIC GAS & ELECTRIC. VG IN WRAPS.. 1970.